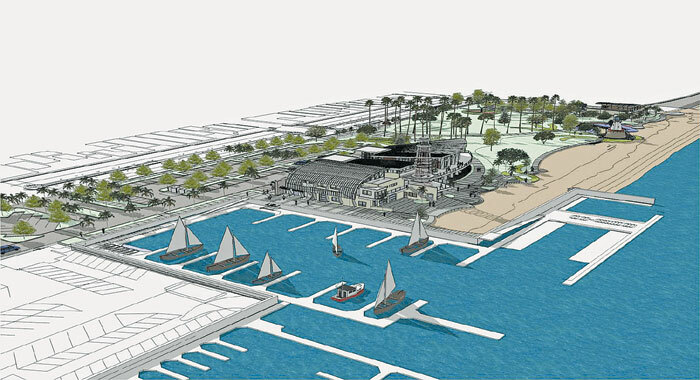 NEWPORT BEACH — The city’s Marina Park project is a step closer to construction, following the Newport Beach City Council’s approval of amendments made to its Coastal Land Use Plan at a May 28 meeting. Passed unanimously with no discussion, the motion approved the final adoption of the plan — which will now be sent to the California Coastal Commission’s executive director, city staff explained. The city can then proceed with an amendment to the Coastal Development permit for a faux lighthouse feature at the park, once the Coastal Land Use Plan had been certified. Earlier this year, the Coastal Commission approved the city’s request for an amendment to include a 71-foot faux lighthouse in the extensive Marina Park project. At that time, the commission voted 8-2 in favor of a land-use plan that will include a tower with a height not to exceed 73 feet. The commission approved the amendment with language specifying that the exception only applies to the Marina Park project as to not set a precedent for future developments along the coastline. The Marina Park project was approved by the Coastal Commission in June 2012 but the commission had deadlocked on a motion to allow the community center’s lighthouse structure to impede the height variance, leaving the height at 35 feet. The city applied for an exception to the land-use plan in 2012. When built, the tower will serve as an identifying feature for the project, although it will not be lighted and is not designed to be an aid to navigation. The project will be located between 15th and 19th streets along Newport Harbor’s Balboa Peninsula, on the site of a mobile home park. The new park will house a 23-slip marina — with 21 slips for boats up to 40 feet in length and two slips for boats up to 57 feet. A 200-foot side-tie area is planned to be used as a public transient boat dock, and the park will include sailing center docks. A 23,000-square-foot community center and sailing center, and a waterfront park will be constructed on 10 acres of bayfront. Basketball half-courts, a children’s play area, restrooms, a new 5,500-square-foot Girl Scout building, a 157-space parking lot and access to a bayfront beach are additional amenities. Designed by Rabbe/Herman, along with Bundy-Finkel Architects, Marina Park is estimated to cost between $20 million and $28 million.